On the other hand, a whole lot of unfortunate souls spend half their night staring at the walls, wondering when scientists will find an easy trick to help them catch some z's. But here's some good news for you. If you're tired of your sleeplessness problem, you might want to try white noise as an aid to help you fall asleep within a few minutes. Yeah, seems a bit counterintuitive — using noise to eliminate noise! Our detailed blog will help you understand all about white noise, including its effect and benefits for adults and babies, and the science behind this technology. Experts define white noise as a blend of every frequency that's audible to human ear at the same amplitude. 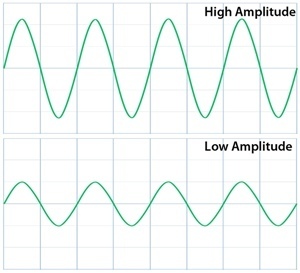 Frequency refers to the number of sound signals whereas amplitude is like height of the sound wave. In layman's terms, white noise is a unique form of a sound signal used to drown out background noise. White noise can also be defined as what humans hear with the combination of sounds with variations in frequencies. That's similar to listening over 20,000 tunes at the same time! Many people find white noise to be consistent and soothing – a sound that won't disturb during the night. With white noise as a backdrop, you can sleep through all kinds of peak noises; such as someone sneezing, door slam, or any ruckus that lasts for a short time. Thus, white noise efficiently screens racket that might either wakes you up during snooze or prevents you from falling asleep. Why do you need white noise? The sensory preferences vary among people when it comes to sleeping. You may either crave for a quiet surrounding or some background noise to enjoy a peaceful night's slumber. It's just like an introvert-extrovert thing. Introverts prefer a calm and silent environment to thrive. But extroverts love an equally loud and noisy atmosphere to do their thing. Similarly, while most sleepers need a noiseless environment to sleep like a log, others simply dislike the quiet. You lie down on your bed ready to sleep when a neighbor decides to get their hammer out and bang every wall of their home. Or a roommate decides to throw a party when you specifically told them you've got an exam the next day. Or you've been traveling around the world almost every day and dreams of getting a few hours rest during the flight seem impossible thanks to the chatty Cathy beside you. Can you relate to any (or all) of these situations? Well, that's when white noise enters to help you fall asleep. According to a survey conducted by the National Sleep Foundation, over 70% of the Americans prefer snoozing in a quiet room. On the contrary, more than 30% of the respondents use some an aid to sleep better. Majority of the sleepers want their bedroom to be a livable place. Thus, they invest in products that would help them relax, be comfy, and improve the overall quality of slumber — such as plants, fragrances, music, and even white noise. How does white noise sound like? HowStuffWorks explains white noise in an interesting way. For instance, imagine 1000 people are talking all at once. It's impossible for your brain to pick out one voice from another and they are all indistinguishable. Now let's say, a person starts screaming at the top of his/her lungs among them. Your brain won't be able to detect that sound because its frequency is nothing compared to 1000 human voices combined. Just like white light is a blend of different colors, when sounds of the all possible frequencies (between 20 Hz to 20,000 Hz) mix together, they create white noise. This is how white noise signals look like. How does white noise differ from color noises? Here a question arises. If you're already familiar with white noise, you must have come across other forms of color noises, such as brown, pink, blue, and grey. So, how is white noise different from them? First, let's take a look at the numerous kinds of noises and their benefits. As you can see, among all different types of noises, white noise offers the most benefits. Dr. Stephane Pigeon, a sounds expert, says that these colorful noises are not included in 'white' category because they help drown out sound peaks at specific frequencies, instead of covering ALL frequencies. Here's how white noise looks like compared to other types. The difference is clear. White noise comprises same amplitude waves but a lot of varying frequencies. Others, focus more on specific amplitudes than on frequency. According to Pigeon, when it comes to white noise, you might want to increase the volume to make it more effective. It does have the correct frequency levels but not in the proper proportion. "If you take another color like brown, it already has that interesting rumble in it, and might work better," says Pigeon. On his website myNoise, Pigeon offers a variety of color and white noise for experimentation. You can adjust the color scrolls and listen to the perfect sounds to drown out surrounding distractions. When is white noise useful? Besides sleeping, white noise can be used in multiple instances. Here is an overview of the various uses of white noise, but we'll take a more in-depth look at its benefits later on. Work: Listening to white noise while working can reduce distractions; thus, helping you finish routine tasks without delays. Travel: Take a white noise generator with you during your journeys. It can make your plane rides or road trips more relaxing, and perhaps you can catch up on your z's in a short nap. Study: White noise is also useful while you're studying. It eliminates surrounding distractions by increasing your focus and enhancing memory. Does white noise work with babies? Good news for exhausted parents — YEP, it works! A 1990 study conducted by J.A. Spencer and colleagues, demonstrated the effectiveness of using white noise to put babies to sleep instantly. The experiment included 20 babies, out of which 80% of infants fell asleep within five minutes of listening to white noise. Even though newborns sleep for a long time (up to 12 hours every day), their cycle is somewhat broken. In other words, babies tend to sleep in episodes throughout the day. It hinders performing your routine chores and makes it difficult to catch a wink at night. Children should be put to bed around 8 pm. It's necessary you create a perfect ambiance for them, so their body gets a hint and starts releasing melatonin. Experts suggest white noise machines for infants to make a peaceful and serene environment. Put on calming tunes or lullabies at least one hour before bedtime while you lie down with your baby. Your baby goes to sleep almost instantly and you're spared all the hard work of patting or singing. Even if you or other family members are still awake, the white noise will block out the external sounds. Thus, your baby's slumber won't be disturbed. Now that you have understood its basics, let's take a look at the various pros and cons of white noise for adults and babies. White noise may not make it to your next jam, but it is quite advantageous for you. Following are the significant pros and cons of white noise. 1. Listening to white noise is a wholesome bedtime ritual. Why do experts keep insisting you incorporate a bedtime ritual in your routine? There must be a significance to it. Having a bedtime ritual is super relaxing. It is a way to vent out and release the pent up frustrations of the day before falling asleep. In other words, night routines are useful for de-stressing and are an integral part of proper sleep hygiene. Listening to white noise every night creates a calming ambiance and sets you in the mood to sleep. Soothing sounds relieve you from the day's anxiety and induces snooze. Thus, making this a habit will be a healthy choice. 2. White color sounds block out surrounding harsh noises. You need an optimal sleep environment to get a good night's rest. White noise magically masks the surrounding disturbing ruckus which might be keeping you awake at night. According to a John Hopkins psychiatrist David Neubauer, white noise serves as a 'soothing cocoon' for people who tend to focus on the small noises around them. Thus, it gets easier to fall asleep with the hum of a fan or gushing stream in your ears. White noise cancels the outer high pitch sounds, and you can easily create a peaceful bedroom atmosphere. Check out this video by David Neubauer regarding white noise in a bedroom. 3. Sleep disruptions decrease with white noise. Do you tend to wake up mid-slumber due to peak sounds — such as slamming of a door, someone coughing/sneezing, cell phone ring, etc.? If yes, you can relate to the pain of going back to sleep after annoying disturbances. Research shows white noise mingles in with similar peak background noises in our environment, which lessens the chances of waking up suddenly due to harsh sounds. This is specially useful in hospitals where patients wake up because of monitor sounds in ICU. Scientists discovered adding white noise to the ICU ones can help reduce sleep disruptions — even if the surrounding sounds get too high. Additionally, sleep expert Raj Dasgupta considers white noise as a nightlight. If you're sleeping in a pitch dark room, you'd hate it if someone turns on a bright light suddenly. However, with a dim glow already in the room, you'd only feel slightly disturbed by the light. "A growling motorcycle or the slam of a door can not only jar you awake, but can shift you to a lighter stage of sleep". Thus, helping you enjoy a more restorative REM sleep. 4. White sounds make falling asleep easier. If you have insomnia, it is difficult to fall asleep the moment you hit the sack. So instead of relying solely on medications, sleep science experts also recommend using white noise as a snooze aid. Not only does white noise block out the external sounds, but has shown early onset of sleep in an experiment. A 2017 study published in Sleep, revealed that insomniacs who listened to white noise in the background before bedtime had 40% less sleep latency issues compared to those who didn't use it. The research further concluded there was no impact on the duration and efficiency of slumber. 5. Elderly with dementia calm down with white noise. Older people with dementia face multiple problems and constant frustrations. They are unable to communicate properly because of the debilitating memory, which makes them moody, depressed, and agitated. A 2018 study conducted by LW Lin and colleagues, found that white noise works as an effortless non-medicated intervention to help elderly folks with dementia. The mood and sleep disorders among them were reduced after they listened to nature sounds for 20 minutes. Nurses and caregivers can use white noise as a simple technique to calm down miserable older people. 6. White color sounds improve memory. Adults who suffer from language learning disabilities can significantly benefit from this technology. Research suggests that using white noise as a backdrop facilitates the neural communication in their brain required for learning new words. After listening to white noise, scientists discovered increased levels of dopamine (a chemical that improves memory and cognition) in the subjects. So it's safe to use white noise for anyone with a language learning disability. 7. White noise works as a tinnitus therapy. Tinnitus is a condition in which a person hears a ringing sound in their ear in the absence of any actual noise in the surrounding. It's not exactly a disease but a symptom of hearing-related problems. Experiments have shown that more than half of the tinnitus sufferers prefer listening to white noise. It helps them focus better by masking the pitch effectively. Even though it has a plethora of benefits for our health, white noise may sometimes pose threats to our wellbeing. Sleep scientists believe continuous exposure to these sounds can negatively impact our brain. They think that low volume white noise can rewire the brain, altering cognitive abilities and decreasing focus. These cons are common among patients who have tinnitus. In some cases, white noise can alter language comprehension or worsen the hearing condition. So, instead of using static-like white noise, experts recommend opting for music or more structured background tunes. They have no side-effects and actually help with increased focus. Now let's move on to the benefits of white noise for our little bundles of joy. 1. White noise helps babies fall asleep instantly. One of the biggest benefits of white noise (for tired parents specifically) is that it puts your baby to sleep almost immediately. With white noise in the background and gentle cradling of mommy's arms, babies finds the ultimate coziness to drift off to slumberland. This is also quite a useful trick if you tend to travel frequently or the infant seems to have varying sleep schedules. Put on a white noise lullaby whenever you want them to sleep — et voila! Your work is done. 2. Babies experience less stress with white noise. During the day, babies can become stressed due to various 'new' stimuli introduced in the environment around them. New faces, sensations, sounds, and lights can make a baby over-exhausted. It could be anything – the slam of a door, someone clapping, a loud burp, or merely getting a diaper change – that could make your little one stressed out. White noise before sleeping helps release the accumulated stress over the day. Thus, it ensures a more deep sleep, and blocks out further disturbances while resting. With white noise, your baby can feel safe and snooze soundly. 3. White noise sounds reduce baby's crying. A baby's sense of hearing is sensitive. Most find it hard to sleep amidst lots of external sounds, and because it's unappealing to their ears, they start crying in the presence of harsh stimuli. This is where white noise comes to save you mommies and daddies. Thanks to the quiet rhythmic tones, soft lullabies, and soothing hush, babies instantly feel calm. Just put on a tune whenever your baby's crying and see the magic unfold! Yeah yeah, it sounds all ah-mazing! But there a few potential risks of white noise for babies too; let's check them out. 1. White noise may cause cognitive development problems. In spite of all the benefits, the white noise machine does not always provide risk-free quiet and peace. Hearing problems may likely occur. Hence, it is suggested to place the machine at least seven feet away from the crib of your baby; otherwise, lower the sound. 2. Babies might become dependent on white noise. Assuming your baby responded well to the white machine. He really likes the sound it emits, to the point that he couldn't sleep or take a nap without it anymore. This makes the machine not greatly appealing. To avoid this, only use the machine when it is really needed, for instance at a vacation. 3. Some babies simply dislike white noise. What can ya do about it, eh? Some parents complain no matter how hard they try for their little one to get adjusted to white noise, they just don't budge! And trust us, forcing won't help. Instead, it would keep your baby up and stressed all night. You might try different kinds of white noise generators that are more natural. Such as table fans, mom's heartbeat, or something similar that's consistent yet deep. Additionally, you can try limiting the volume to approximately 50db. Place the machine a bit far from the crib. It's completely okay if your baby does not like white noise. Everyone has their own sleep needs and maybe, your little one likes pin drop silence while snoozing. Don't fret! Now, at this point, if you're convinced white noise is suitable for you and your baby, you might have some burning questions. "How can you generate white noise? What works as a white noise? What are some of the best white noises trending globally?" Next we'll explore the above queries in detail. What are white noise generators? These sounds are generated using white noise machines. It is a device that creates a random sound like rainfall or soothing hum of wind. Most of the white noise machines cost between $15 to $100 — some of them are even free! Following are the most common types of white noise machines you can find on the market. Electronic noise machines: They produce sounds of waterfalls, wind, or rain. The noise can be played over and over. CD recordings: They are cheaper as compared to other noise machines. While this is a budget-friendly option, there's also a drawback to using CD noises as sleep aid. The tracks can be interrupted or stopped suddenly when the playlist ends. You will need to wake up to change it. Mechanical noise machine: It creates sounds comparable to a fan. Most people prefer mechanical sleep aid noise machines as the sounds are familiar to the ears and seem pleasant. Some might find the volume to be too low and unfortunately, you cannot make it louder. Mobile phones: Mobile phones have downloadable apps (some are free!) useful for generating white noises. Simply connect your mobile phone to your speaker and hear the magical sounds to drift off to sleepland. Mouth: This one is a no-brainer. Our mouth can generate white noises too — such as the shushing sounds a mother makes to put the baby to sleep. Home appliances: Many general appliances in our homes help generate white noises. For example, hair dryers, fan, vacuum cleaners, and clothes dryers create a consistent ‘whirring' sound that instantly puts you to sleep. Sleep machines: Sleep machines are also white noise generators looking similar to a radio. It has adjustable volume settings and is portable( ideal for traveling). Are you intrigued enough to find the top trending white noise tracks for a peaceful slumber? Awe-some! Here's a list of the best white noise sounds you can listen while cuddled up in bed. Guaranteed — you'll fall asleep within 5 minutes! Does TV noise work as sleep aid? Short answer — there is no definite yes or no. Due to ongoing research on the topic, all we can say is a big fat MAYBE. It means falling asleep in front of the tv may or may not help you with an improved snooze. Now let's see why sleep experts have varying opinions about falling asleep while watching TV. A National Sleep Foundation survey revealed that over 60% people watch television before going to bed. We are soaking up a high amount of blue light from electronic devices before bedtime which actually impacts our sleep quality. Most of the time, we find it difficult to fall asleep at least three hours after scrolling through social media or watching Netflix. Chris Brantner, a sleep science coach, considers watching TV before bed a bad habit that ultimately affects your overall sleep hygiene. You'd delay going to bed for at least two hours and sometimes, you might even start binge-eating during a late-night movie marathon. Hence, it might seem like a bad decision to doze off while the TV is on. What can you do to mitigate the side effects? But, Dr. Vikas Jain (sleep medicine specialist), thinks if the television is on low or medium volume — not so high that it sounds too loud or interrupts your thoughts — then it may work as a white noise machine. Thus, it negatively affects the various processes your brain performs to remove the waste, reboot the mind, and re-energize your body. How to use TV as a white noise machine? White noise from TV — does it work? In order to reduce your screen-time, you can turn away from TV screen and rely only on audio. Brantner also suggests putting tuning the settings of your screen to turn off after some time. But try not to be too dependent on this white noise sleep aid, per Jain's warning. What if you suffer a sudden outage and don't have access to TV? Too much of a good thing can be bad for your wellness! Myths about white noise — debunked! If you're trying to figure out the pros and cons of white noise, you might come across many myths circulating around the topic. Let's uncover a few popular ones and find out the truth behind them. All white noises sound similar. Not really. That's because even if it does sound consistent, white noise has two different types — a low pitch and a high pitch. Each of them provides a unique sound effect. The low pitch white noise is rather monotonous and can be described similar to the sound of rain, plane and car rumble. It can be boring to listen to but effectively puts you to sleep. On the other hand, the high pitch white noise is comparable to whines, beeps, alarms, or screams. This type is suitable for increasing focus but not for sleeping. Understandably, for babies, low pitch sounds are recommended as white noise. Adults may like a combination of both high and low, or just the latter, before bedtime. White noise should be quiet. White noise is not necessarily quiet. In essence, it is a mixture of lots of frequencies, so it tends to get a wee bit loud. Additionally, experts recommend using loud volume when listening to white noise tracks to block out the external high pitch sounds. If you're using it for a baby, again, set a volume that's high enough to drown surrounding sounds. White noise is only needed by insomniacs. White noise is not only useful for adults and babies who have difficulty falling asleep but it also works for those who simply want to experience deep sleep. White noise eliminates mid-snooze disturbances and ensures REM sleep, which is essential for your overall well being. Thus, besides insomnia patients, anyone can benefit from white noise as a sleep aid. In conclusion, white noise is a quality technique to help you enjoy a better sleep experience. It is completely non-invasive and is ideal for insomniacs who don't like to rely solely on medication. By combining white noise and a good mattress for your body, you can enjoy a relaxing night's sleep you deserve. Honestly, what's better than investing in a cozy environment and making your bedroom worth resting in, eh?